Under this rubric, we want to relate interesting observations or interactions with fishes. Have you observed some curious behaviour, amusing incidents, or strange interactions involving fishes, or fishes and some other animals (including humans)? Please tell us about your interesting (happy, sad, frightening, amusing, perplexing, etc) fish encounters. We start this series of fish stories with my – unbelievable but true – encounter with a friendly wrasse. We were collecting fishes at the Kamaran Islands off the Red Sea coast of Yemen in April of 1998. I was one of four marine biologists crammed into the steel catamaran sailing yacht ‘Breakwind’ (no lie – that is the name of the ship!). Also on board, were the very able Captain Matthew Grimley (South African who also designed and built the ship), First Mate Sean Kelly (also from South Africa), the Captain’s fiancé, Emily Madghachian (Lebanese /Canadian from Dubai), the ship’s mascot, Jessie, a small black and white skipperkie , and the organizer of the expedition, Mr Jonathan Ali Khan (entrepreneur / photographer from Dubai). The other marine biologists were Jerry Kemp (Ph.D. student from the University of York, studying reef-fish distributions in the Red Sea and Gulf of Aden); Uwe Zajonz (graduate student from the Senckenberg Research Institute in Frankfurt, studying Red Sea fishes) and Michael Eisinger (from the University of Essen, studying corals). We (Uwe, Jerry and I) were doing a fish collection in about 5 metres of water over a coral reef. Out of the corner of my eye, I noticed a group of five or six fishes about to overtake me. The leader of the pack was an adult male crescent-tail wrasse, Thalassoma lunare, and he was busy chewing on something that the other fishes seemed interested in. I watched the wrasse working its jaws, and saw something shiny at the front of its mouth. The fish then veered right in front of me and spat out a small shiny object that settled on a flat piece of coral immediately in front of me. The fish’s action was as if to say, “Here, have a look at this!” I was surprised to see that the small shiny object the fish had been chewing on was a stainless steel screw about 5 mm long. I thought, “That’s strange. I wonder where the fish found this? Maybe it is something that Uwe or Jerry dropped or fell off their diving gear.” I picked up the screw and put it in a pocket of my BC vest. After the dive, back on ship, I asked Uwe and Jerry if they had lost a small screw from their gear. Neither recognized it as part of their kit, so I tucked it away in my little cubbyhole (my living space was too small to be called a cabin). Diving the next day, I was turning the knob on the second stage of my Oceanic demand valve to adjust the breathing tension, when the knob fell off in my hand. I then realized that the little screw that the friendly wrasse had brought me was mine, and that it must have been spotted by the wrasse as it fell out of the knob on my DV or soon after it landed on the bottom. The wrasse then picked up the screw in its mouth, raced ahead of me and dropped it right in front of me, as if to say, “Hey, you dropped this!” I couldn’t believe it! 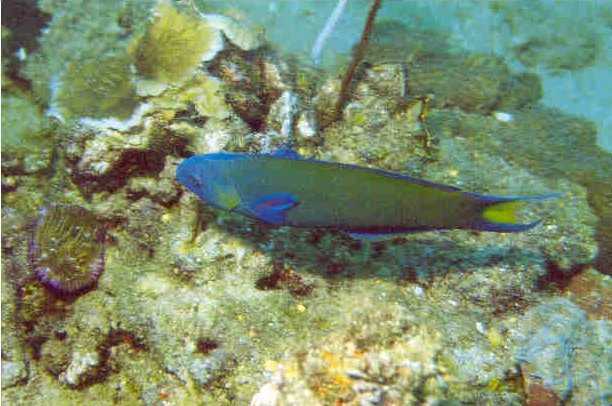 Now my favourite fish is the friendly crescent-tail wrasse, Thalassoma lunare. On my last visit to Umkomaas, I heard dire reports of ‘Aliwal abuse’ and spearfishermen wiping out “bankies” rockcods and knifejaws. How does one evaluate these allegations? Here is an example of how the East Coast Fish-Watch Project can help us learn more about fishes and what is really going on under the water. To begin, we need to know which fishes we are talking about. “Bankies”, also known as bank steenbraas or fingerfins are members of the Family Cheilodactylidae: including the bank steenbraas, Chirodactylus grandis; Natal fingerfin, Chirodactylus jessicalenorum; and the twotone fingerfin, Chirodactylus brachydactylus). Rockcods, aka “groupers”, are serranids of the genera Epinephelus, Cephalopholis, Plectropomus, and Variola. Knifejaws, also known (incorrectly) as “parrotfish” are (at Aliwal Shoal) usually the Natal knifejaw, Oplegnathus robinsoni or the Cape knifejaw Oplegnathus conwayi. Now that we knew what we talking about, on our next dive, I asked the divers to count all of the bank steenbraas and fingerfins they saw. I quit counting at 40, and the other divers also reported the bankies as common. I did not see any rockcods or knifejaws on this dive, but talking to Mark Addison, I learned that rockcods have never been all that common on Aliwal (which is to be expected for a top predator like rockcods). If the rockcod population at Aliwal has, in fact declined significantly (and this is quite possible), we cannot blame the spearfishermen, until we know exactly how many rockcod they are taking, compared to the catch of commerical and recreational anglers. As for knifejaws, you have to know where to look for them. They prefer certain areas on the Shoal, and if one dives there, you will see lots of them. But their populations may also fluctuate seasonally. Monitoring the fish populations and the fisheries on Aliwal Shoal will not be easy, but one of the first things we need to know is which species are there. Once we have divers who can confidently identify the ‘threatened’ species, then we can begin to do some real verification of what is going on there.